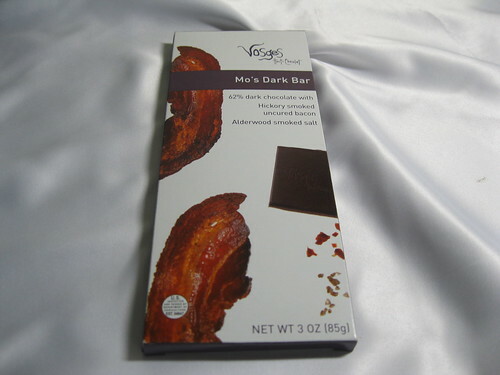 It's taken a while to get to this, but prompted by a request poised near my recent chocolate restocking spree, I did not fail to pick up Vosges' 62% dark chocolate with bacon and smoked salt at my local Whole Foods. I had been procrastinating on it for some time given the whopping price tag of $6.99 for a single 3 ounce bar, but this time around I justified the expense. It's quite an odd combination, this bacon and chocolate, but the producer makes quite a convincing case as to why it works given the story of her breakfast bacon crossing with the pancake syrup on the cardboard sleeve. Given the photography session prior to the tasting, quite some anticipation was built up in the process. 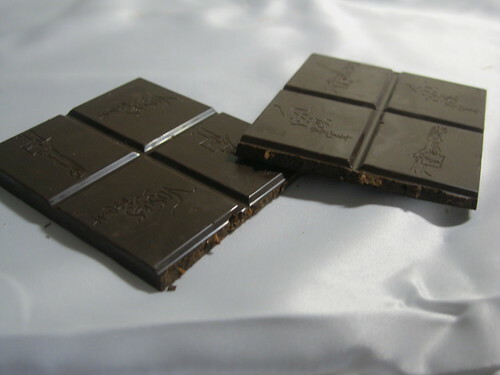 It smells very smoky and has a pungency similar to some kind of barbecue sauce, the smells all getting along just fine with the aroma of sweet chocolate. In breaking it apart I was surprised at how soft the bar felt for something of 62% darkness, pulling apart instead of snapping, and then read on the back that the cocoa solids are rated at a 48% minimum, which means the balance may favor the cocoa butter. Once I finally did get to eating it I was treated with a very sharp sense of sweet, almost milky chocolate that has been salted just to my liking. It doesn't taste very smoky or have much of what you'd consider a bacon-ey flavor, but it is notably meaty, and bacon is the first thing that comes to mind when eating. I'm salivating a little bit as I write this and feel regret that the bar is now gone. The flavors mesh together perfectly, each attribute very dominant and distinct, in no danger of being drowned out by another. Given the confectioner's story as to how she came up with this concoction, I can't help but wonder why she didn't include maple, as I think it would be a wonderful compliment, completing the experience. Throughout my eating I kept thinking of and craving pancakes soaked with maple syrup, so she certainly set the atmosphere with her breakfast story. My only qualm, of course, is with the price. This chocolate is the stuff of cravings, and yet how often could you budget for one? As a connoisseur I have to argue that it's worth it nonetheless, and am definitely adding it to my list of favorite chocolates. If you find it and have a little extra spending money, don't miss out. Hsieh in AT: "Thank You, Steve Jobs"